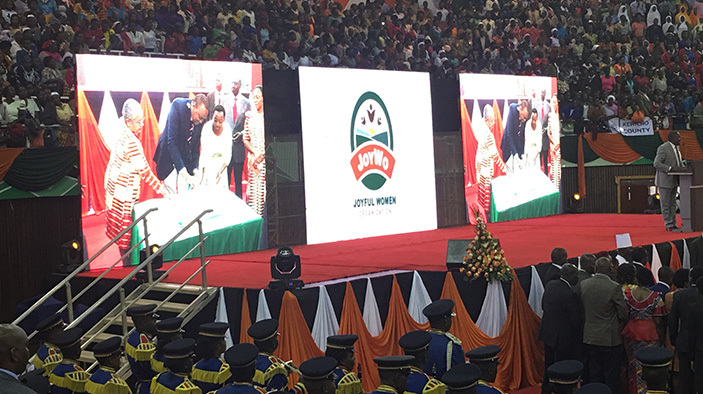 The plan was unveiled during JOYWO’s annual thanksgiving celebration in Nairobi, attended by thousands of supporters and heads of state. The plan calls for the organization to reach 1 million women clientele across Kenya with entrepreneurial training and small business loans by 2021, among other goals such as enhancing advocacy efforts, strengthening market access, and establishing strategic partnerships. More than 6,000 women JOYWO members attended the event. Kenyan President Uhuru Kenyatta, First Lady Margaret Kenyatta, Deputy President William Ruto, and Second Lady Rachel Ruto, who is JOYWO's founder and patron, presided. JOYWO was formed in 2009 to economically empower Kenyan women and enhance household food security by supporting women’s involvement in livelihood projects. JOYWO’s flagship project has been providing financial resources to women through “table banking,” where small groups of women meet on a regular basis to borrow and lend to one another to fund small-scale entrepreneurial activities. The program achieved great success in its first five years, growing from 10 employees serving approximately 170 women in one county with an initial loan fund of $6,000, to 65 employees serving 17,000 women across eight counties with a total revolving fund of $3.9 million by 2013. This rapid expansion came with new challenges, leading JOYWO to approach FIRM for assistance in scaling up. FIRM was well positioned to partner with JOYWO, as the project and its predecessor have been working in Kenya since 2007 to improve the financial services sector. FIRM was already helping to build the capacity of the commercial sector to deliver customized financial products and services for entrepreneurs and small businesses, particularly in rural areas, so the partnership was a great fit, according to FIRM Chief of Party Mark Rostal. Initially, JOYWO requested FIRM’s support in addressing the institutional and human capacity gaps it faced as a result of its growth. FIRM responded by developing training manuals for JOYWO’s human resources department and community mobilizers in the field as well as initiating a training-of-trainers program to help mobilizers advise borrowers on prudent business growth strategies. In 2014, as JOYWO continued to expand, FIRM developed additional manuals on credit, operations, finance, and risk management, as well as standardized training curricula and related materials for each business unit. By the end of 2015, JOYWO had close to 180,000 women clientele and its growth had far exceeded any previous expectations, requiring a significant update to its original 2013-2018 strategic plan. Given the successful partnership with FIRM, JOYWO asked the project team for additional support in early 2016 in guiding the next phase of growth, which included FIRM conducting a financial review and providing growth projections. JOYWO today has more than 182,500 members, with $23.5 million in its revolving loan fund and a presence in 45 out Kenya’s 47 counties. The organization’s livelihood programs have also empowered women with information on modern agriculture, entrepreneurial skills, clean energy, and affordable housing.